One of the main problems this movie suffers from (aside from the non acting, the plot holes bigger than star Tor Johnson’s backside, and the chimp-like direction) is that there’s virtually no spoken dialogue in the movie. Supposedly, the audio track for this movie was accidentally erased so the director had to go back and narrate the story himself and his narrative skills are as subpar as his directing skills. He talks at inappropriate times, repeats himself, and worst of all, says a lot of things that are supposed to sound important, but come off like he was just thinking this stuff up as he went along. He keeps saying lines like “so and so is caught up in the wheels of progress” and “so and so is caught up in the wheels of justice.” The nadir of this whole thing had to be when the movie was trying to rip off North By Northwest‘s crop duster scene and as this guy is running on the ground while being shot at from a plane, Coleman breaks off with this stunning observation, “a man runs, he is shot at.” Ugh, that was even worse then when he said that people go on vacation to the north, south, east, and west. Thanks for the insight! Tor plays a really fat guy (he must have at least a sixty inch waist!) named Joseph Javorsky. J.J. is some type of nuclear scientist from the Soviet Union who has all this secret information about the Soviets and their secret moon landing. If these papers really revealed that the commies had beat us to the moon, why would they keep it a secret? Wouldn’t they want the world to know that they were first? J.J. has all this top secret crap in his briefcase and for some reason he is flown out to the Yucca Flats Atomic Testing Grounds by U.S. military personnel. Even though they have come to this high security (there’s a barbed wire fence with a sign saying “Keep Out” shown later in the movie) facility for who knows what reason, two Russian agents have also managed to show up at the strip, by driving their car up to it. 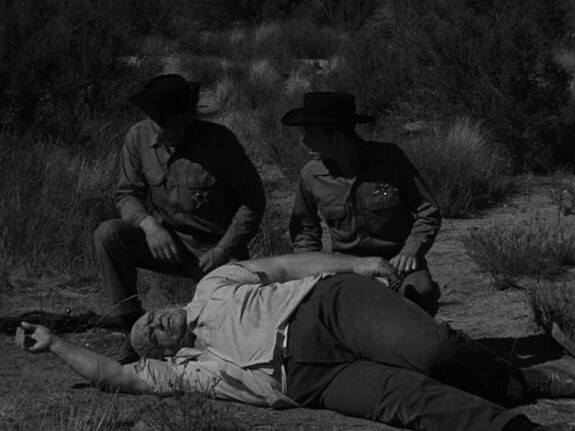 A shootout occurs and during the gun battle, someone gives Tor the briefcase and he lumbers off into the desert in an effort to get away. That’s pretty sound strategy for you. Give the football (that’s what those of us in the black ops biz call important briefcases) to the 600 pound dude and have him run away with it into the blazing desert sun. 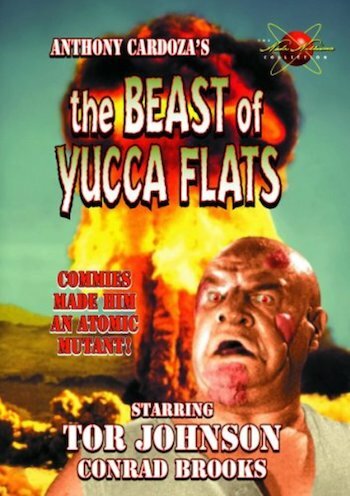 And remember how this happens on the Yucca Flats Atomic Testing Grounds? Guess what they happen to be testing the very same day that they also decide to have an open house for Russian defectors? An atomic bomb! So Tor is ambling across the desert with his precious briefcase, when all of sudden an atomic bomb gets dropped on Tor’s bald head. Tor survives the blast, but has been transformed into a hideous beast! Oh wait, that’s just Tor with some dried toilet paper pasted to his head. Tor has now become an honest to gosh rampaging monster on the loose! He kills a guy changing his tire, then he chokes out his wife and drags her up to his shiny new secret hideout cave that he just leased and spends a good deal of time chewing on her hair! Meanwhile, the local yokel law enforcement team of Joe and Jim get on the case. Somehow or other they track down the cave that Tor has hidden the woman in. I guess it’s a really small desert. Meanwhile this vacationing couple gets a flat tire (doesn’t anyone get their tires checked before driving off into the desert?) and their two kids run off to play with a cactus or something, so the old man goes off to find them, while the homely wife is left at the side of the road with the rest of the trash. Up in the air plane, Jim sees the guy running around looking for his kids and immediately starts shooting at him. What follows is one of the longest scenes where a guy is running and getting shot at from an airplane you’re ever likely to see. Finally, after firing about fifty rounds at this guy, Jim parachutes out and gets picked up by Joe. That’s pretty close to mission accomplished, I’d say! Tor and the kids hook up and eventually the kids escape his cave and then Jim and Joe show up to shoot Tor, but Tor gets up and throws Joe down and then trips and falls and lands on top of Jim. Tor gets shot some more times, then we see a brief instance where Tor’s shirt comes partway up exposing about an acre of his gut and the viewer shudders in horror for the only time during the entire movie. Things end as a little bunny shows up and harasses Tor as he dies! This movie is nowhere near as good as this review probably makes it sound. 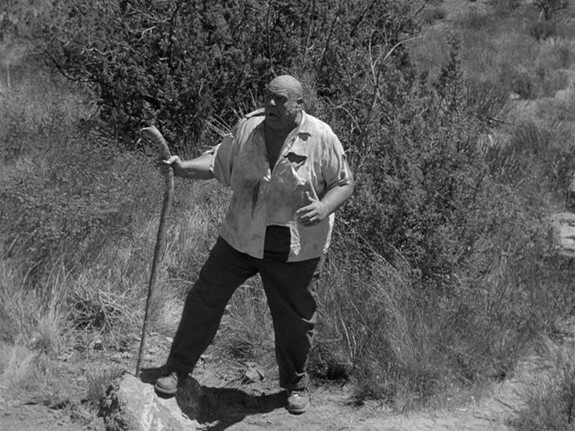 Everyone involved in this film stunk the joint up like a Tor Johnson left out in the desert sun. It wasn’t fun to watch at all and you simply cringed at how unprofessional everything was. And don’t let the “fat guy gets nuked and kills people” plot trick you into thinking that this is worth your time. The film doesn’t really exploit the idea in a very good way. The only time they use the gimmick in a slightly amusing way was when Tor fell down on Jim. I’ve never seen that in a movie before. The Beast of Yucca Flats will leave you feeling like Tor sat on your face and farted.